Direct methanol fuel cells (DMFCs) have received tremendous research interests because of the facile storage of liquid methanol vs. hydrogen. However, the DMFC today is severely plagued by the poor kinetics and rather high overpotential in methanol oxidation reaction (MOR). Here we report the investigation of the ultrathin Rh wavy nanowires as a highly effective MOR electrocatalyst. We show that ultrathin wavy Rh nanowires can be robustly synthesized with 2–3 nm diameters. Electrochemical studies show a current peak at the potential of 0.61 V vs. reversible hydrogen electrode (RHE), considerably lower than that of Pt based catalysts (~ 0.8–0.9 V vs. RHE). Importantly, with ultrathin diameters and favorable charge transport, the Rh nanowires catalysts exhibit an ultrahigh electrochemically active surface area determined from CO-stripping (ECSACO) of 144.2 m2/g, far exceeding that of the commercial Rh black samples (20 m2/g). 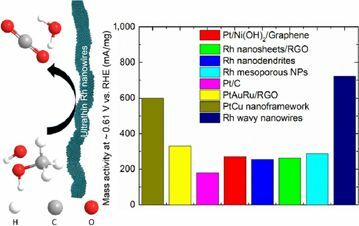 Together, the Rh nanowire catalysts deliver a mass activity of 722 mA/mg at 0.61 V, considerably higher than many previously reported electrocatalysts at the same potential. The chronoamperometry studies also demonstrate good stability and CO-tolerance compared with the Rh black control sample, making ultrathin Rh wavy nanowires an attractive electrocatalyst for MOR.